Advantages: Excellent research, entertaining reading, great use of pilots’ accounts, superb artwork. Greg VanWyngarden is no stranger to writing about the men and aircraft of Jagdgeschwader Nr I. His knowledge of the subject makes him an ideal choice to pen this 16th volume in the series. The 128-page book contains over 120 black and white photos with 39 colour profiles. Some of these are enhanced with additional scrap views. Many aircraft types are covered and Harry Dempsey has done his usual superb work in covering these German machines. Subjects depicted are the Albatros D III, D V/Va, Pfalz D III/IIIa, Fokker triplane and of course the Fokker D VII. Even the Fokker parasol makes a couple of appearances. Some of the artwork has been seen in previous Osprey publications but has thankfully been kept to a minimum. Reproductions of the photos are good (where the print being worked from allows) and compliment the text very well. The captions also have been well thought out and add much to the readers’ knowledge. Excellent use has been made of the various pilot diaries, letters and interviews available to the author. These provide an interesting commentary not only on life within the 4 Jastas but the personalities of their pilots as well. Tidbits here are Gisbert-Wilhelm Groos’s (Jasta 11) opinion on Göring’s war motives, and Hans-Georg von der Osten’s (Jasta 11) recollection as to why Ltn. Wüsthoff had to be replaced as Jasta 4 commander. Also noted was a snippet from Jasta 10 pilot Friedrich Rüdenberg. He recalled an ominous moment that occurred when Werner Voss filled in the paperwork to gain confirmation for his 48th victory, a DH 4 of 57 Sqn. He accidentally filled in his own name in the space reserved for his victim. Later that day, Voss himself was the “victim”. The book is divided into six chapters with appendices at the rear. The latter gives tables of Jagdgeschwader Nr I commanders, component Jasta commanders, JG I Orden Pour Le Mërite winners, and JG I aircraft serial numbers where known. Chapter 1 starts off with a brief explanation of the component Jastas and why such a formation had to be created. 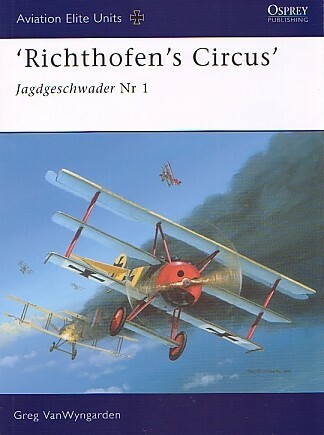 From here the reader is taken through the unit’s adventures in Flanders under the charismatic leadership of Manfred von Richthofen. Not long after, we see the introduction of the triplane and the subsequent falling of their leader. The group would soon have its name changed to Jagdgeschwader Freiherr von Richthofen Nr I as a tribute to their fallen commander. JG I is seen moving from one “hotspot” to the other and the book captures this from the great German Spring Offensive (Kaiserschlacht), until the final flights to Darmstadt and Strasbourg. Comprising of Jastas 4, 6, 10, and 11, Jagdgeschwader Nr I was the most famous such unit in WWI. It was Germany’s first Fighter Wing and under the leadership of Manfred von Richthofen it was a formidable opponent. In compiling the exploits of the unit, Greg VanWyngarden has done an admirable job and this is certainly a worthy addition to the series.